Easter made his England debut against Italy in the 2007 Six Nations just one week after his England Saxons bow against Italy A. He soon cemented his place in the elite ranks and scored a remarkable four tries against Wales in their Rugby World Cup warm-up clash later the same year and would go on to start six matches at RWC'07 as one of the stand-out performers on England's run to the final. Injured for the opening round of the 2008 Six Nations, he regained his place from England debutant Luke Narraway the following week and was voted man of the match in England's victory over France in Paris. He failed to get the nod for Martin Johnson's first Elite Player squad in the summer 2008 but injuries saw him drafted in for the autumn internationals where he made the most of his promotion by starting all four matches. Easter was subsequently rewarded for his strong run of form for both England and his Premiership side Harlequins by being recalled to the Elite Player Squad for the 2009 Six Nations. He played all of England's Tests during the tournament and both of their summer fixtures against Argentina, with the series ending 1-1. Injury ruled him out of England's poor 2009 November series, but upon his return to the Harlequins side his form was good enough to secure an international recall ahead of the 2010 Six Nations. He toured with England to Australia in June of that year and then started all four of that November's autumn internationals as he strengthened his hold on the No.8 jersey and led the Test side for the first time against Samoa. He remained a key figure during the 2011 Six Nations and following injuries to team-mates Lewis Moody and Mike Tindall he was handed the captaincy for the Six Nations Grand Slam decider against Ireland in Dublin. After winning the Amlin Challenge Cup with Harlequins, Easter took his place at the back of the England scrum for their match against Wales in the second warm-up Test. He was forced to sit out England's final friendly against Ireland before being named in Johnson's 30-man squad for the tournament. Easter struggled with a back injury during the tournament but still featured against Argentina, Scotland and France. Following England's ignomous exit, Easter was alleaged to have said, "That's £35,000 down the toilet". 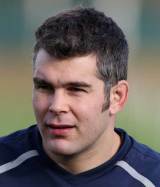 And Easter was one of the high profile absentees when the 2012 EPS squad was announced for the Six Nations.